The severely restricted space and barren environment of the fur farm, with nothing of interest and no opportunity to perform normal behaviours, results in abnormal, repetitive movements such as circling, pacing and chewing. These abnormal behaviours indicate that the animal is suffering and cannot cope with their environment. Foxes can also display exaggerated fear responses, fur biting and tail biting , with some mothers even killing their babies. 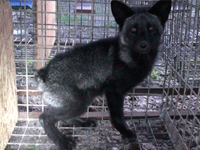 During our observations foxes without tails were housed alone in much smaller cages, their loss of appendage likely a result of chewing due to stress, either by themselves or other foxes. Animals were also seen chewing and pawing at the cage mesh, displaying a desire to both escape and perform instinctive digging and gnawing behaviours. 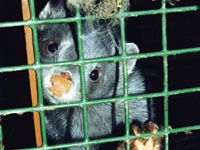 On mink fur farms, animals live in tiny cages alongside thousands of others, causing chronic aggression and biting. Mink have several nest sites in the wild, and territories of up to 4km in size. Fur chewing is typically the only abnormal behaviour reported by the fur industry because it has a direct impact upon fur production, although it is not the only one displayed. Chinchillas, for example, also display back flipping and bar chewing. Foxes have been farmed for their fur since around the beginning of the 20th century, however, they remain wild animals whose nature has not been modified through breeding by humans and therefore retain all of their wild instincts and needs. Shy and fearful of humans, their mental and emotional suffering is intensified by the extreme confinement of the farming environment. In contrast to the facts, the fur industry attempts to justify the continued use of these animals by claiming that foxes are domesticated. This is not the case and selective breeding to make foxes more docile, more dog-like, results in changes to their fur that are not consistent with what the product the industry demands. Such animals are not used commercially, resulting in the farmed foxes experiencing a fear of humans which is a major and very common welfare problem. While the fur industry suggest that farmed foxes do not need to dig because they have no need to make a nest or bury food like wild foxes, studies show that captive foxes have a strong desire to perform these innate behaviours. Another claim is that the semi aquatic mammal mink does not miss having water in which to swim if they have never had it. An independent study however has shown that mink consider access to a water pool the most valuable resource, even showing signs of physiological stress, similar to that displayed when deprived of food, when access is prevented. Even fully domesticated species such as rabbits, also farmed for their fur, have the desire to carry out naturally wild activities, with their range of behaviours highly influenced by their wild ancestry. On fur farms, the small, wire floored cages which animals live in for their entire life, provide no opportunity to run, dig, hunt or play; torture for animals with innate behavioural needs.